Have you read Getting Ready to Get Ready For Winter? In the northern parts of the U. S., summer, and most of autumn, are once again gone. Though a hard frost hasn’t coated the windows and weeds yet—except in the far reaches—most of the flowers are finished and only stalks and seed heads remain. Still, there’s a few straggling asters left in the wettest parts of the fields, sought after by desperate bees but ignored by most for they know those lonely white flowers are barren and gone. Nature has little left for the bees. However, on rare days when it warms to over 50… when the sun shines and the wind settles enough… ambitious bees go looking for the last of the season’s wine. It’s in their genes to seek and find. This first winter can be daunting for a beekeeper just beginning. But then, winters are always daunting… that a box of bugs manages to stay alive, moving, buzzing, raising young, eating, sleeping… when only inches away it’s cold… too cold for them to live… is one of those fascinating mysteries beekeepers revel in. Here’s how it works, and how you can help. 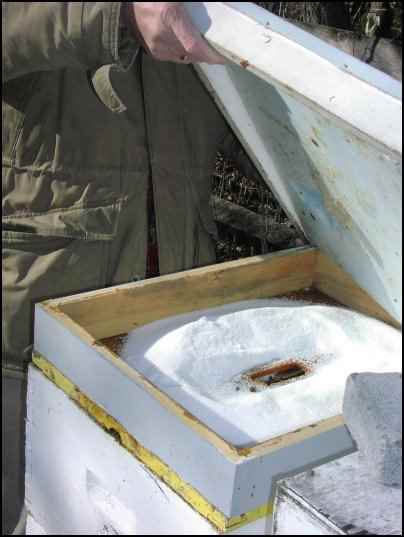 It’s still not too late to feed sugar syrup in central and southern parts of the U.S., and there is a host of inhive feeders available to use. These replace a frame in the bottom box if there’s room. If the weight of the colony is low, feed the bees a 2:1 sugar:water solution until they quit taking it. First, bees don’t heat the inside of their hive. The air, well, most of the air inside that stack of boxes is just about exactly the same temperature as the outside air… so it’s cold inside in the winter. Rather, when the temperature begins to drop the bees’ first order of business is to keep the brood warm… and the brood needs to stay at right about 93 degrees or so… warm by any standard. To do that the bees begin to gather together and cover the brood, using their bodies to warm the brood in the beeswax cells they are covering. But wait… bees are cold blooded… not like you and me. How’s that work? 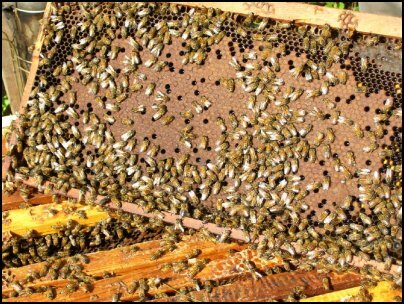 Some bees stand directly on the surface of the comb that contains capped honey and stored pollen plus they are hovering over and covering all the brood, both sealed and open. Some bees go head first into cells next to brood on both sides of the comb and generally fill all the empty space beside, over and under any brood in the comb so the brood is completely, totally surrounded. When the brood is covered and safe the remaining bees do the same, head first in cells, standing on the comb surface, rubbing and touching and filling in all the empty spaces. Protein supplements may also be necessary if there isn’t much pollen stored. The bees won’t need it now so much as shortly after the beginning of the new year, when the queen begins laying eggs in earnest again. Without a steady source of high quality protein egg laying will be restricted and the population of the colony will be compromised for early nectar and pollen flows next spring. What you end up with is a bunch of bees forming a football shaped cluster basically in the lower center of the hive, encompassing all of the brood and some of the honey they previously stored. They protect the brood, and they eat the honey. But remember, they’re still cold blooded. What they do next is amazing. The individual bees on the outside of this mass of bees turn to face the center of the cluster, exposing the tips their abdomens to the outside… where the business part of the bee is—the sting. Once positioned, these bees, and many of the bees inside the mass of bees close to the surface, but usually not those closest to the center, begin to vibrate their wing muscles… and, just as you and I begin to warm up when we exercise, these vibrating bees begin to warm up and that heat is transferred to the rest of the bees in the cluster. Wide open spaces lend themselves to too much wind. 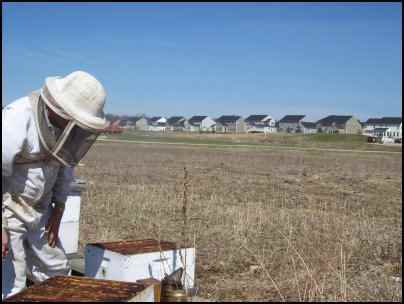 If your bees have this kind of landscape surrounding them, seriously consider a windbreak to help reduce the stress on the hive. Use snow fence, fence posts with landscape burlap, straw bales, or any temporary fence to keep cold winds at bay. Meanwhile, the bees in the center consume the honey, feed the young brood if any are present, and tend to the needs of the queen—who may, or may not still be producing brood. Remember that these bees are crammed in together taking up less than a quarter of the space they were when it was summer time. Consider putting 20 people in a typical elevator…and having them run in place…the effect is the same in the bee hive. One other factor is that bees are covered with hairs…lots of hairs. Pushed close together, these hairs add insulation to each bee, and slow the loss of body heat and warm air from the mass to the cold world outside the cluster. Meanwhile, the bees on the outside of the cluster, shivering and vibrating like mad also reduce the flow of warm air away from the inside of the cluster. Last resort feeding is to put sugar on the inner cover surrounding the inner cover opening. Don’t make this a habit, plan ahead and get the food on the bees sooner. So for a time all is well with the world. But after a bit of this—depending on the temperature—the bees on the outside begin to tire, they use up their food reserves and can no longer continue. Hunger, cold and exhaustion set in; they must be warmed, fed and rested or they will perish, and with them, all the bees inside the cluster. When these bees are on the edge, close to collapsing, they slowly move toward the heat, the warmth, the food…life. But this heat-holding layer must be maintained or all is lost. And it is replaced… well, usually it is. Warm, well fed, rested bees from the inside of the cluster migrate toward the outside of the cluster to replace those moving in. Recall that not only bees on the very outside of the cluster were holding heat in, vibrating muscles and keeping everything warm, but many just below of the surface were also…and it is these that move to the surface, while the warmest bees begin to move up and outward. All the bees in the cluster need to eat. The first assumption here is that there was enough food in the hive, in the right place in the hive. 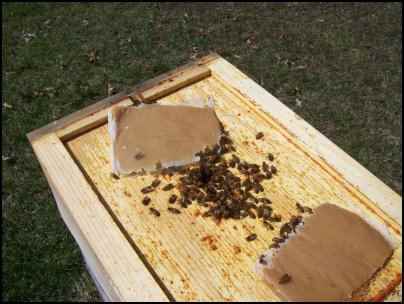 First the bees eat the food they were covering but after a time all that is gone. And since heat rises, the bees follow the warm air upwards in the hive and move up to where more honey is stored… providing they, or the beekeeper, provided more to be stored. This works, all winter long. As long as the air just outside the cluster stays warm enough for the bees to move. If it doesn’t, if the outside air is so cold the bees can’t warm it enough, they can’t move the cluster, they can’t move to more honey, and they will starve… inches from more food. This is why bees don’t rule the world. 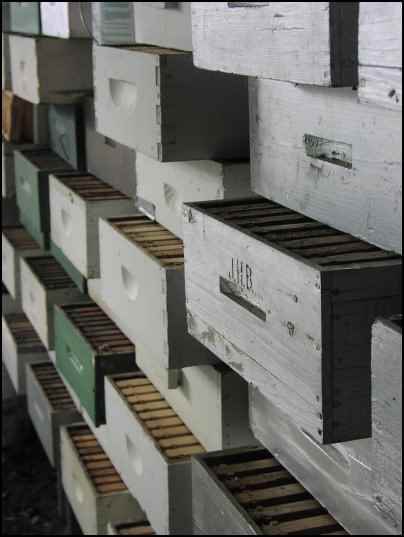 Beekeepers need to make sure, when they put their colonies to bed for the winter that they have both provided enough honey for the whole of the winter and early spring, and made certain it is in the absolute most convenient location in the hive. How much? They’ll need 50-60 pounds of honey, more if way up north. Where? Place it just to the sides and above the cluster, which should be very near the bottom of the hive in the fall, so the cluster can rise, en masse, to the top, consuming all that honey as it goes. 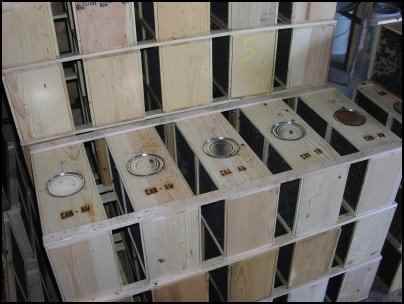 Since you have already taken your losses in the fall, plan now on how you will replace those losses next spring by purchasing packages or nucs from local beekeepers (probably your best choice). Making splits from your existing colonies is a good choice too, but that requires a whole different set of preparations. And one more thing: ventilation. All that warm air contains respiratory moisture. 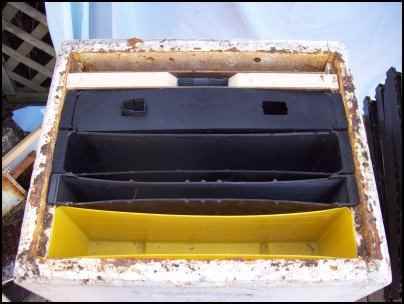 The moisture condenses when it comes in contact with the cold sides and inside top of the hive (like warm breath on a cold window). Condenses, collects, and then drips down on the bees. Cold, wet bees are unhappy bees. And pretty soon, dead bees. 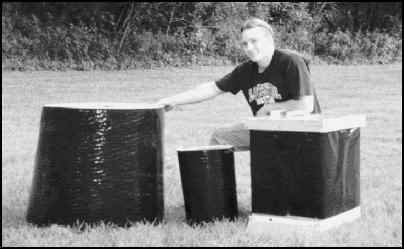 You have two choices: provide lots of ventilation so that warm air rises and exits the hive immediately, creating almost a gale inside the hive, but keeping the drips away, or, sealing it up so the warm air rises, but is trapped and isolated above the bees and beneath the cover—some beekeepers simply use batten insulation, or homosote board, or a super filled with straw or leaves—whatever it takes to hold the moisture so it doesn’t drip back on the bees. And then wrap the hive… but not too much. Just a layer of roofing felt paper will do. Make sure to leave the ventilation intact, and not to cover the entrance below, or above if you use one. A simple plastic wrap can be used in place of roofing felt. It is durable, reusable and protects the colony from the ravages of the wind. And that should mostly do it: food, ventilation and protection from the wind and elements. Knowing what your bees need, and why, makes the planning easy.